The new season, the new collections. What are the best Chanel bags to buy this season? 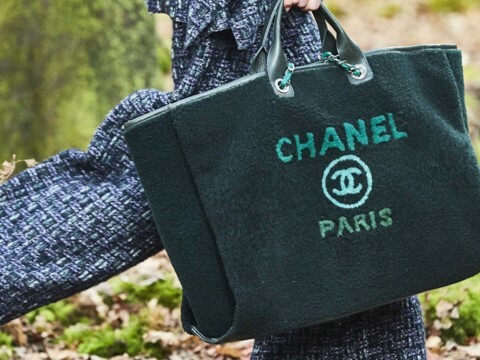 Have you seen already the new Chanel fall winter 2018 collection? They are all gorgeous, which is not a surprise. It is hard to find a Chanel handbag that would not make our heart melt. But even though we would be happy to get our hand on any of those, which are the best Chanel bags to buy this season? Chanel’s fall winter fashion show was quite extraordinary with runway looking like an autumn forest full of fallen leaves of all colours. The clothes were breathtaking and the bags yet again exceeded expectation. You could see all the earthy colours with pop of pink or off white. There was a loads of tweed as well, I think this fabric is beautiful on handbags for the fall. But what are the best Chanel bags of the season? I have taken the liberty to find out for you and the result you can see below. My two criteria are quite simple. I will be looking at overall design desirability (long term popularity) and trend factor (is it a bag that will still look trendy in 5 years, or more of seasonal piece?). Number 1. Large shearling shopping tote. Let’s start with this large shearling lambskin Shopping tote. I am afraid this one is one of the most expensive of the lot here (£5,760). However you can wear it over and over again. Ok, maybe in summer you would choose different bag, but winter after winter, this bag can be your great companion. I also love the green colour. It makes it even more interesting. Imagine wearing it with chunky cosy sweaters and wool coats. Next I chose this gorgeous python skin clutch. Animal prints and designs are always in high demand especially in the fall, however I would be happy wear it all year long. It is fairly small (the smallest here), but you can surely manage your wallet and phone. For the price tag of £3,700 can be yours. It wouldn’t be an article about best Chanel bags without including at least one classic Chanel Flap bag. Chanel Flap bag is the synonym of luxury elegance and I love this new design with the top panel, which costs £3,750. It looks new and modern yet classic and timeless, especially in black. In 30 years this bag will still look contemporary. My next choice is this large Flap Bag with top handle. This one is a little bigger then the previous black one. There is something very classy about these top handle Fla bags. They look like they could have been worn a decade ago, but again, like any Flap bag, these are timeless. I love the khaki green in combination with pink handle and you can get it for £3,790. I was writing about Chanel Gabrielle bag here and of course I had to include the new release here. The golden black combination is gorgeous especially the antique look of the gold part. In terms of size, this one is small version of Gabrielle bag, but I think it is one of those bags you will love to wear from work to dinner. It will cost you £3,260 but will last for years. This new Chanel 31 large shopping bag is ideal for those carrying around loads of unnecessary stuff (hands up who is guilty of that, no shame lol ). I love the way you can fold it and carry it around like a clutch. Such a clever idea! The combination of black and beige is so Chanel, you can’t simply go wrong with piece, provided you want to pay £3,350. This bag has an amazing variation, ideal for fall, like this one or this one, but maybe you wouldn’t wear them in summer? I wasn’t such a huge fan of vanity cases but recently I started to appreciate them more and more. There is something very feminine about them, would you agree? This would be a perfect day day and if you team it with a chic dress like this one and elegant boots, I promise you will look million dollar. The price tag is £3,520. My next choice is yet again a Chanel Flap bag with a top handle. This time in creme colour. I had to include this one because of the colour. How amazing this will look in winter and how incredible it will look in summer with gorgeous dresses? Even though I am aware creme or white handbags are very difficult to keep in good shape, as they tend to get dirty pretty fast, they always look amazing. So when it comes to this handbag, you can’t go wrong with either the design or the colour. Both utterly timeless. The cost is £3,610 and it is slightly smaller then the khaki green one above. Another Vanity Case in burgundy colour. Honestly, I love this colour. This is definitely one of my favourite (with the creme one above) of the top 10 best Chanel bags to buy this season. It can’t be better for fall however it will be easy to combine with clothes all year round. This Vanity Case is also a bit smaller than the beige one above, which makes it great bag for day and night. It costs £3,440 and for that price you will get yourself another timeless Chanel handbag. My last, but not least choice is this grey large Chanel Boy bag. This post is about the best Chanel bags to buy this season. So, even though there is nothing much new except this gorgeous matt grey colour, this bag is one of the most popular choices. Practical, elegant and classic. Ideal for those looking for their first Chanel Boy bag. It costs £3,890, but should you have spare money for a luxury designer bag, why not this timeless piece? 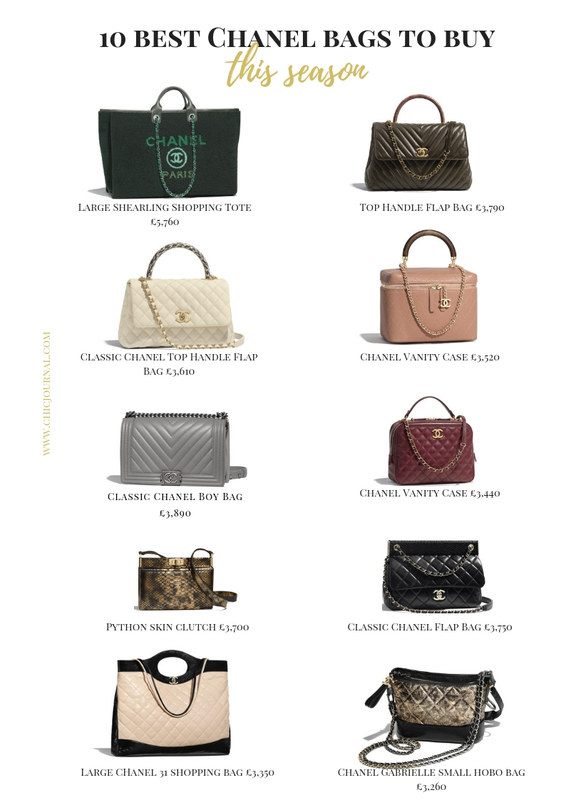 So these are my top 10 best Chanel bags to buy this season. Which one is your favourite? Previous Post What to wear with pleated maxi skirt in the fall? I’m dreaming of getting a chanel bag and the boy is my favourite. one day it will be mine. Hi Elena, I hope you will get it soon. Chanel bag will last you for years and you will never get bored 🙂 Good luck! You can’t go wrong with the classic flap bag. Also, it’s good to experiment with style once in a while, such as with the vanity case. Awesome picks you have here dear! Thanks for sharing.